湖泊科学 2016, Vol. 28 Issue (1): 225-236. DOI: 10.18307/2016.0126. 姚静, 张奇, 李云良, 李梦凡, 定常风对鄱阳湖水动力的影响. 湖泊科学, 2016, 28(1): 225-236. DOI: 10.18307/2016.0126. YAO Jing, ZHANG Qi, LI Yunliang, LI Mengfan. 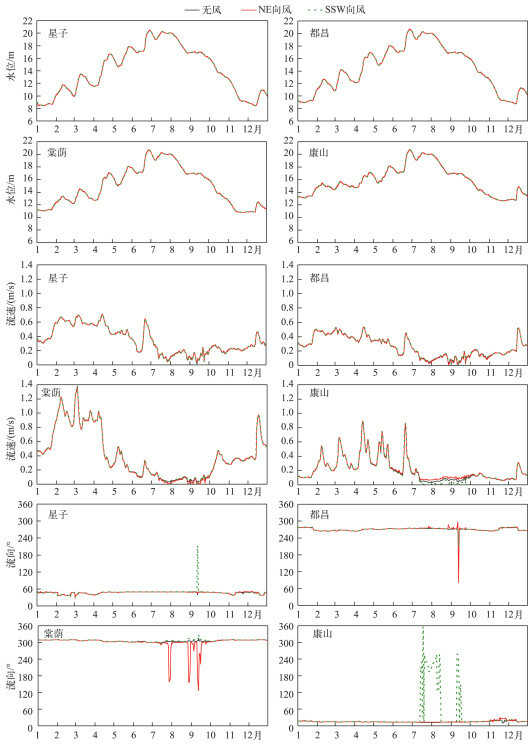 The influence of uniform winds on hydrodynamics of Lake Poyang. Journal of Lake Sciences, 2016, 28(1): 225-236. DOI: 10.18307/2016.0126. 摘要：鄱阳湖属大风区, 风场作为仅次于流域"五河"倾泻和长江顶托作用的另一重要驱动力, 或在某些时刻影响局部区域的水流结构, 进而影响局部水体中泥沙、污染物、营养盐等物质的输移和扩散.基于鄱阳湖二维水动力数学模型, 模拟定常风场条件下的鄱阳湖流场分布及环流形式, 并与无风条件下的水流时空结构进行对比.结果表明:3.03m/s的NE向和SSW向定常风对湖泊水位影响微弱; 对流速的影响主要集中在7月中旬至9月底的"湖相"期; 其影响区域主要分布在湖区中部大湖面偏西岸及东部湖湾, 约占湖泊最大水面积的16%;上述区域出现明显环流, 环流结构具有时空异质性特点, 环流区流速普遍增至无风时的两倍以上; NE向和SSW向风场产生的环流位置相近, 方向相反.相比于以往鄱阳湖水动力研究中对风场的忽略, 本次研究揭示了定常风场对鄱阳湖的重点影响区域、影响程度及影响形式, 可为泥沙及污染物输移模拟中对风场条件的处理及可能带来的误差与误差的空间分布提供重要依据. Abstract: Lake Poyang is a strongly wind-affected region. 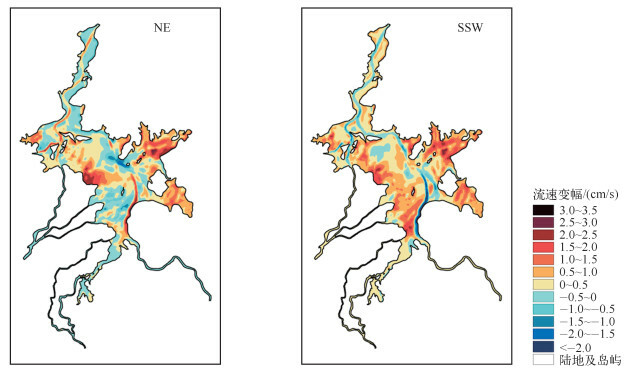 The wind stress, as the secondary driver after the catchment forcing and effect of the Yangtze River, may influence the flow pattern of local lake body at certain times, which affects the transport and diffusion processes of sediment, pollutants and nutrient substances. Based on two-dimensional hydrodynamic model, the flow distributions and circulation patterns were simulated under uniform wind conditions. 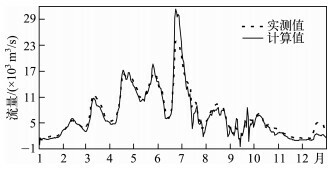 Comparisons were made between cases of no wind and uniform wind in order to investigate the spatiotemporal patterns of the flow. The results showed that, for NE and SSW steady winds at 3.03m/s speed, the impact of wind on water level was negligible, and the effect on flow was mainly restricted to the west coast and eastern bay between the middle of July and the end of September. In the affected regions(about 16% of the total lake area), obvious circulations were noted, which showed spatial and temporal variability, and where average flow velocity was approximately twice as much as that for no wind condition. NE and SSW wind-driven circulations occurred in similar locations but corresponding flow directions were opposite. 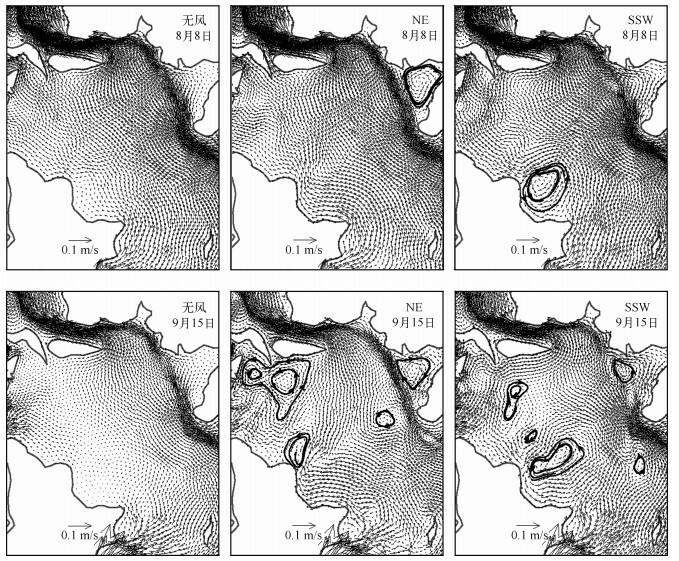 In comparison to previous hydrodynamic simulations of Lake Poyang that ignored wind effect, this study enhanced the understanding of the location, magnitude and pattern of uniform wind forcing effect on flow. It hints the potential uncertainty in sediment and pollutant transport modelling when dealing with wind conditions. 该模型已对2000 -2008年的水位、水面积、流量、流场等水动力指标进行了全面的率定和验证[15 — 16]，表明模型具有关键过程模拟方面的能力和优势，故此处仅对2010年的水动力过程进行进一步验证.对湖区南北分布的4个主要水文站点(图 1)的水位过程(图 2)和湖口站的流量过程(图 3)进行验证，验证误差见表 1.结果显示，水位和流量过程吻合较好，除湖口流量验证误差稍大外，其余各水位验证相对误差均在±3 %之内，确定性系数均在0.98以上，Nash-Sutcliffe效率系数也均达0.95以上.流速验证方面，从以往鄱阳湖水动力模拟研究来看，缺乏流速资料验证是一直以来共同面临的问题.如何在缺乏资料的情况下，有效地验证流速的真实性和准确性？自2013年底开始，于星子和湖口附近，进行多次ADCP断面流速监测(图 1)，积累了部分流速断面资料.本文选取2014年5月23日星子断面和2013年12月4日湖口断面的流速监测资料，分别代表洪、枯季(高、低水位)的流速情况.由于缺乏2010年之后的水文数据，无法模拟2013、2014年的同时刻流速断面并与实测值进行比较.为使不同年份的流速具有可比性，选择本模型水情与2010年相近的时期进行流速对比.2014年5月23日测得星子附近断面水位约为18m，流量为11280.1m3/s，根据2010年的模拟情况，选择5月26日水位17.8m、流量12200.6m3/s条件下的星子断面流速与之比较；2013年12月4日测得湖口断面水位7.4m、流量1386.9m3/s，选取计算的2010年12月8日水位8.1m、流量1207.1m3/s条件下的湖口断面流速与之对比.断面以河道左岸为起点，沿垂直河道方向，至右岸结束，枯水时由于水量减少、河宽收缩，实际监测距离小于模型中的左右岸边界距离.从断面流速对比可知(图 4)，在相似水情条件下，流速断面从量级到分布趋势都比较接近，但毕竟不同年份水情不可能完全相同，流速量值存在一定的偏差，且由于不同年份断面局部地形变化，存在小范围内流速变化不一致的情形(图 4a).总体而言，这种流速对比方法在缺乏验证资料的情况下也不失为一种可行的替代方式.综上所述，模型在2010年水位、流量和流速方面模拟较好，能真实反映水动力变化过程. 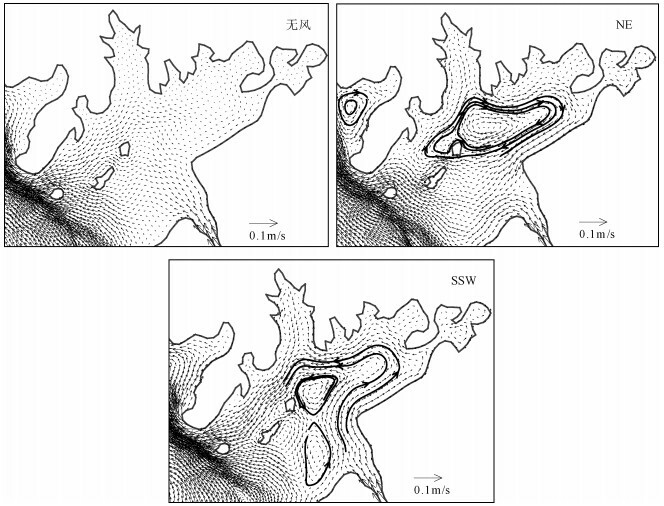 Bloesch J. Mechanisms, measurement and importance of sediment resuspension in lakes. Marine and Freshwater Research, 1995, 46(1): 295-304. 逄勇, 濮培民, 高光等. 非均匀风场作用下太湖风成流风涌水的数值模拟及验证. 海洋湖沼通报, 1994(4): 9-15. 逄勇, 濮培民. 太湖风生流三维数值模拟试验. 地理学报, 1996, 51(4): 322-328. 朱永春, 蔡启铭. 太湖梅梁湾三维水动力学的研究—Ⅰ.模型的建立及结果分析. 海洋与湖沼, 1998, 29(1): 79-85. 谭国良, 郭生练, 王俊等. 鄱阳湖生态经济区水文水资源演变规律研究. 北京: 中国水利水电出版社, 2013. 熊道光. 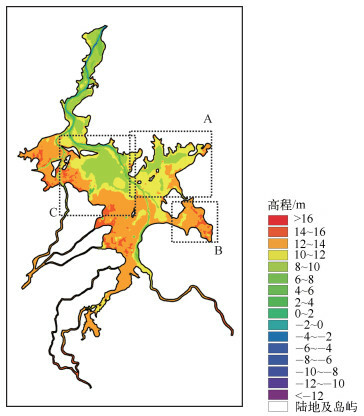 鄱阳湖湖流特性分析与研究. 海洋与湖沼, 1991, 22(3): 200-207. 尹宗贤, 张俊才. 鄱阳湖水文特征(Ⅱ). 海洋与湖沼, 1987, 18(2): 208-214. 程时长, 卢兵. 鄱阳湖湖流特征. 江西水利科技, 2003, 29(2): 105-108. 谭国良, 李国文, 喻中文等. 鄱阳湖动态水位面积容积关系研究. 中国水利学会2013学术年会论文集-S2湖泊治理开发与保护. 北京: 中国水利水电出版社, 2013: 736-742. 程时长, 李良文. 鄱阳湖的风情及风浪特性. 海洋湖沼通报, 1993, 4: 1-12. 姜加虎. 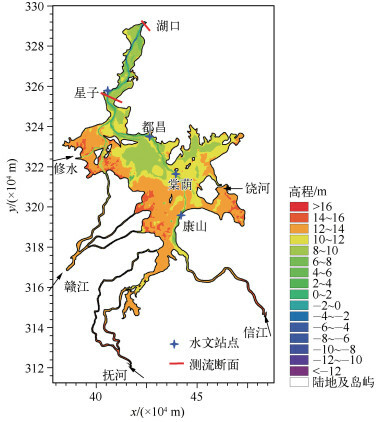 贡湖及其相关水域风生流模拟研究. 海洋湖沼通报, 1997(4): 1-7. 曹慧江, 杨芸, 朱建荣. 滴水湖夏季环流的三维数值模拟. 华东师范大学学报:自然科学版, 2006, 4: 78-83, 90. 韩龙喜, 陆东燕, 李洪晶等. 高盐度湖泊艾比湖风生流三维数值模拟. 水科学进展, 2011, 22(1): 97-103. 葛刚, 纪伟涛, 刘成林等. 鄱阳湖水利枢纽工程与湿地生态保护. 长江流域资源与环境, 2010, 19(6): 606-613.